Click here to visit the Green Mountain facebook and like them. 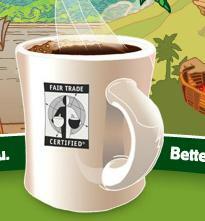 Then on the “Fair Trade” tab, click the picture. Allow their application and you’ll finally be able to request your sample. having trouble getting to the page asking for my mailing info. Was looking forward to trying the sample. Green Mountain coffee is very good! put in my info to request sample. As much as I’d love to try their coffee, I’m not going to an insecure “APP” for it. What’s the point of that requirement? i loveeeeeeeeeeeeeeeee their K Cups!!! Would not work. Said I needed flashplayer 9.0. Don’t make sense I have 10.3 flashplayer. ??? This sounds really good. I look forward to trying it. Thank you for providing an opportunity for a free sample.